Although I am descended from some good seamstresses, the talent did not descend to either my mother or me. My grandmother’s home was filled with remnants of cloth, lace, trim, etc., passed down to her. I still have some of this material in my “stash” of stuff “to do something with,” and as a child I loved to go through the bits and pieces. I was thus curious when I found some interesting accounts listing the cloth and trimmings supplied for Lydia, the widow of Joshua Scottow/Scotto, merchant, of Boston. 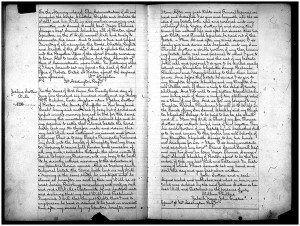 His will, dated 23 June 1696 and proved 3 March 1697/8, left his entire estate to his wife for her lifetime and then directed how it was to be divided among their children after her death. Two sons-in-law, Thomas Savage and Samuel Checkley, were made co-executors and agreed to split costs equally between them. Their accounts show payments made to each other while boarding Lydia in their homes. For example, Savage’s account includes £36 for Lydia’s board from November 1698 to November 1701. In 1705 Savage paid £21.13.4 to “Brother Checkley for boarding Mother Scottow two Years.” In the final accounts, the executor of Savage’s estate calculated it was owed £190.1.5 by the Scottow estate. Samuel Checkley submitted his bill for £252. Clearly, the widow Scottow’s wardrobe was maintained to very high standards. I’m just glad I didn’t have to do the sewing. Note: Widow Lydia Scottow was the matriarch of a large matrilineal family through her five daughters. 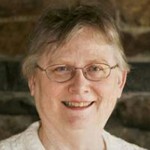 See Julie Helen Otto’s article “Lydia and Her Daughters: A Boston Matrilineal Case Study” in NEHGS NEXUS, 9(1992):25, available on AmericanAncestors.org. Suffolk County, Mass., Probate #2432, 8:110. Suffolk County, Mass., Probate #2932, 6 (New Series):200-207. Fascinating! What an interesting look into fashions of yesteryear. I found a definition in a 1914 book, Dictionary of Textiles, for cotton ferrets as “Cheap bindings or unsized tapes in England in grey or black. Judi’s comment looks more related, but still related. Ferret n. [Ital. foretto, dim. of fiore flower; or F. fleuret. Cf. Floret.] A kind of narrow tape, usually made of woolen; sometimes of cotton or silk; — called also ferreting. Scot’s cloth, several places describe it as a heavy fabric of a tweed type. This is intriguing, but I wasn’t about to scroll through how many pages to find the completed line! Jerry, thanks. This is logical for “Scot”, but the “handkerchief” part was throwing me. Instead, they probably meant something like a shawl. I found the quote in an article about modern fashions. This version of Scot Cloth was a tweed that was supposed to be nearly waterproof. Looked in my large Oxford Universal Dictionary, 3rd Edition 1944. Included the following: 1576 It. fioretti – gloss silk, and F. fleuret. 1. 1612 floss silk. 2. 1649 A stout cotton or silk tape. They must have been pretty. Thank you. Definitely not what we think of handkerchief material! Perhaps might their sense/definition of “handkerchief” was different in those days? I found this definition of “hand-kerchief” on p. 374 of an 1863 issue of “The Willenhall magazine” (https://books.google.com/books?id=IPQHAAAAQAAJ&pg=PA374&lpg=PA374) … in an article on language “fossils” (discussing the changing meanings/usages of some words over time): “hand-kerchief, a covering for the head to be carried in the hand.” Perhaps that sort of head-covering “hand-kerchief” required more substantial cloth than we use for today’s personal-hygiene or fashion-accessory-oriented handkerchiefs. Yes, that is undoubtedly what they meant. Thank you, Alicia, for your mention of my article on “Lydia and her Daughters” in NEXUS, now almost 25 years old! At the time I wrote it, Gary Boyd Roberts and I made an extensive search of the literature and realized that, much to our surprise, it was the first purely matrilineal treatment of a New England family in 150 years. Lydia’s (and Savage’s) inventories reinforce the truth that just because of their religious views, no Puritan–especially no rich one–felt the need to dress badly. You bring back fun memories–of poring through Mass. Bay records as Lydia in her salad days hales into court some fool who thought he could pass off a forged order for money on her…dredging through Scottow and Savage inventories for “Dyatt [food supplies] for Mother”…those lovely lengths of damask… free trips through vanished luxury households such as Suffolk Deeds 11:192-93 (sale of house/goods of Benjamin Gibbs, Lydia’s deceased son-in-law, in 1678–lots of “turkey carpets” i.e. 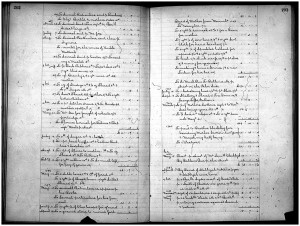 Oriental rugs)…and Samuel Sewall’s original account book (one of the NEHGS Manuscript Dept. treasures) containing accounts with the Scottows on behalf of Joshua’s widowed sister Rebecca (Scottow) Winsor. Like the published Diary, the account book says she’s his sister, but the account further specifies she lives in his house! (No need for Lydia to worry about maintaining her sister-in-law–Rebecca died only a week after Joshua, in the vile Boston winter of 1698 when it was too cold for even the family to attend his burial. Julie, Thank you. I’m not surprised that Lydia was also living with Samuel Sewall, as he was one of the executors. My next step was to look at his diary to see if he mentioned the funeral. Hmmm. Wonder who we can talk into digitizing Samuel’s account books! Of course, I meant Rebecca, not Lydia living with Sam. I should have been more clear. Too many male pronouns! 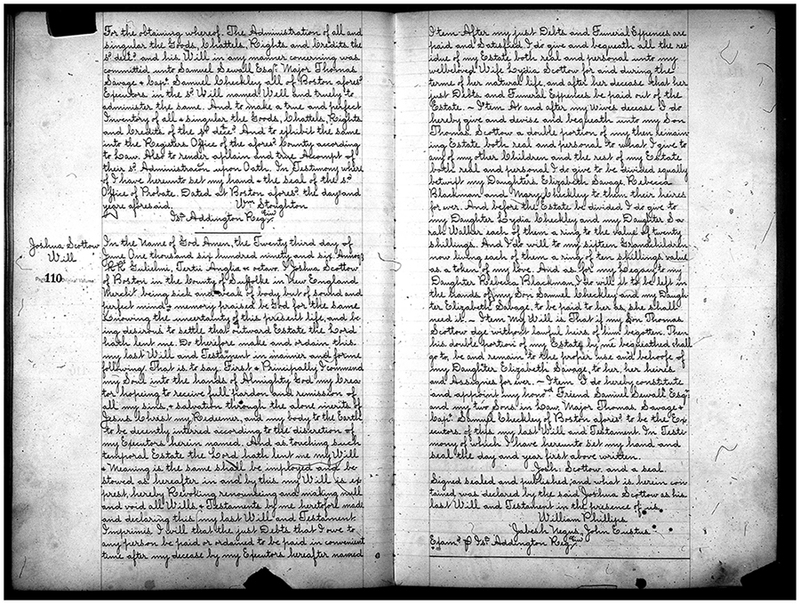 The wording in the account book indicates the widow Rebecca Winsor was living in the Scottow household, which would make sense given she was Joshua’s sister (as noted in the Diary but missed by Torrey). 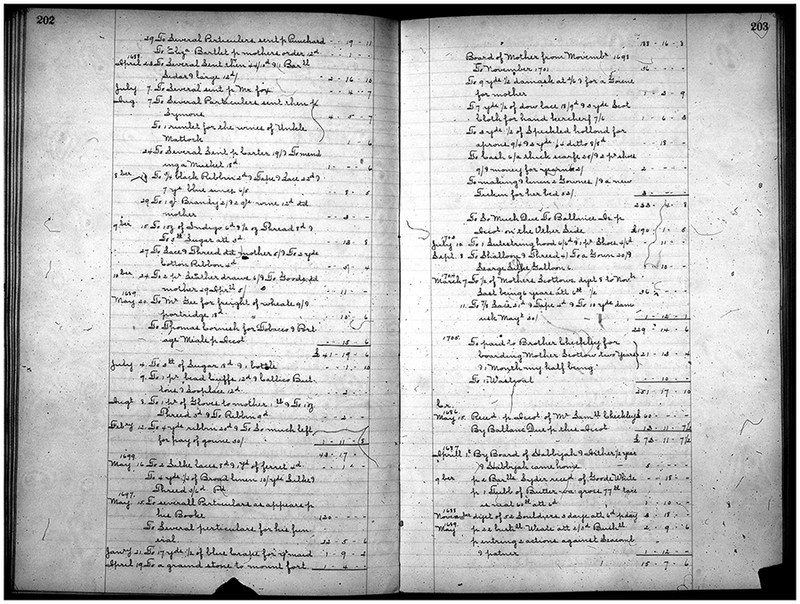 Digitizing Sewall’s account books…what a luscious prospect. Mmmm! What a fascinating post, and discussion! And what a delightful peak into the life of a relatively wealthy woman of the late 1600s. How I’d like to have sifted through some of that fabric and examined it! And the discussion provides aAnother reminder that as we read the accounts left by our ancestors, we need to take care in interpreting their words– they may not have meant what we assume, as terms change, and their meanings shift over time. Annie, we’re never too old to learn something new! I found this definition in A Dictionary of Costume and Fashion: Historic and Modern by Mary Brooks Pickens for something called dowlas. It is heavy, coarse linen fabric made in France in the 16th century, and in Scotland and England in the 18th century; similar to sail cloth. I also found “scotch cloth: a low grade of lawn” in The Fairchild Books Dictionary of Textiles (no author given). This last definition makes sense in context of handkerchief. Nancy, thank you. It certainly is a world unto its own! I am guessing that the coarse woolen cloth called Peniston was named for the parish of Penistone in Yorkshire, where many of my wool-weaving ancestors lived. Jennifer, good idea. My father’s people came from Halifax, Yorkshire, and were in the textile industry there. Alicia, you had me drooling over your ‘stash’! A couple of suggestions: Put them into a simple scrapbook, along with any photos of the garments if you’re fortunate to have them. You can always make a crazy-quilt, even a small one, to hang. I was the lucky recipient of a small collection of laces gathered in Europe by my hubby’s grandmother. As I made my own wedding dress, I chose a high-necked Victorian waist and used the bits and pieces of lace to cover the lower sleeves, neck and chest. Turned out just gorgeous! Even had a large enough piece to make an overskirt for the slim skirt on the dress. Another idea: I used the leftover bits to make myself a Christmas stocking, along with buttons, beads, bits of silk ribbons, etc, from several grandmothers in shades of white, ivory, ecru, etc. For hubby’s I used jewel-like colors of silk ribbons, embroidered cuffs and sleeves that had been saved, buttons, and even the front of a beaded purse. A good way for a man to save ‘feminine’ bits of family history! Debra, thanks for the ideas. My current thought is to weave the pieces into an off-loom weaving of some kind. In my spare time. Your spare time…….[smiling!] Love the idea, though. A nod to our greatgrandmothers’ weaving sounds perfect!